Today marks one hundred years since 11 November 1918, since the armistice was signed between the Allies and Germany at Compiègne, France, marking the cessation of hostilities on the Western Front. Today we therefore remember all the local men and women who contributed to the war effort, both at home and overseas. This includes the 4272 people who gave their lives in the course of this conflict as well as the many more who were involved. In common with many Councils across the land, local Councils, including Wolverhampton, Bilston and Heath Town, were keen to remember the local people who contributed. Mainly this consisted of lists of local men who had fallen, and they relied on grieving family members to provide them with the details. Following the war, Wolverhampton Council set up the War Memorial Committee, which included such eminent local people as Mayor Thomas A. Henn, Charles T. Mander, Samuel Wells Page, and Alderman A. Baldwin Bantock, and even included Emma Sproson. Local organisations including trade unions, factories, sports and social clubs and local churches, were asked to provide representatives to sit on the Committee, so that the resultant memorial would truly reflect the desires of the people of Wolverhampton. Suggestions were gathered concerning what sort of permanent memorial would be appropriate. The most popular suggestion, and therefore the original plan, was a public Memorial Hall, to serve as a place for concerts and meetings, on the site of the Retail Market, now St Peter’s Square. This would have been roughly located where the Civic Centre is now. The aim was to have a Cenotaph attached to the Memorial Hall. However, the Committee were unable to raise the necessary subscription funds, so had to scale their plans down to just building a Cenotaph. The preferred location for this was in West Park, until it was decided to locate it outside St Peter’s Church. Following a competition, a design by architect G. H. T. Robinson was chosen, and the memorial was unveiled on 2 November 1922 by Admiral of the Fleet, Sir Doveton Sturdee, Bart. It does not include any of the names of the fallen, as the Roll of Remembrance was still being compiled at the time. Both Bilston and Heath Town Councils also erected civic memorials locally. In addition to the main War Memorial, many other local churches, works and factories, and sports clubs and societies, compiled and erected their own memorials to local men who had given their lives in the course of this conflict. Doug Lewis’s “Wolverhampton War Memorials” site includes details of many of these, including the names listed on them. The BBC World War One at Home live touring event is at West Park this weekend as part of the Wolverhampton & Black Country Show. Wolverhampton Archives will be represented together with the rest of our WAVE colleagues. On Saturday 12th July, archivist Heidi Mcintosh will be meeting Larry Lamb at 12.30 in the briefing room, talking about our white feather letter. Come along and find out more! 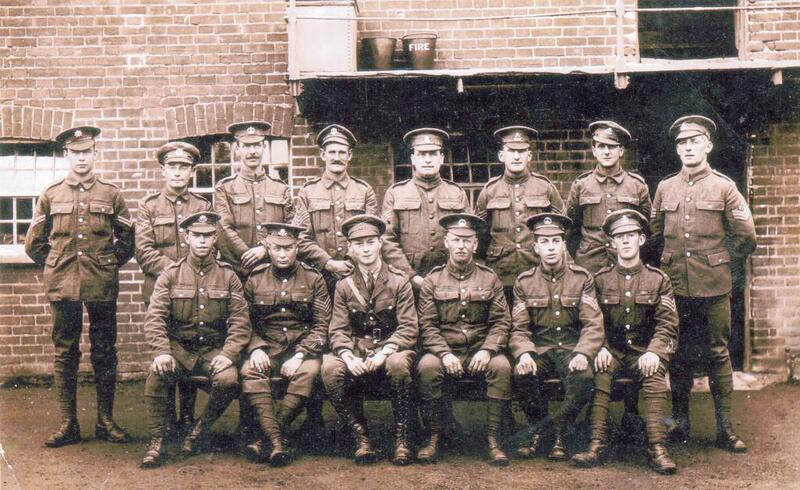 What did the First World War mean in Bilston? This autumn, Bilston Craft Gallery will be commemorating the 100th anniversary of the start of the First World War. We’re keen to include people’s local knowledge and family history to understand the impact this world event had in Bilston – for its people and its industry. Do you have any memorabilia or records relating to the First World War? Did any of your relatives or family friends work in local factories during the Great War? We’d like to find out more! Please tell us your stories using the form below. Frederick Hubert Austin: His death of pneumonia in November 1918 suggests that he was a victim of the Spanish flu epidemic. Albert Abraham Beach: He did, in fact, have three sons, his third, David Wesley, was born in 1924 and has just celebrated his 90th birthday. George Thomas Cadman: He may never have served with the London Regiment. His service numbers have six digits, which tell us that he was a Territorial Force soldier, so thismay have been purely administrative. He is shown with the same regimental number for both London Regiment and Royal Fusiliers. The Royal Fusiliers had no territorial battalions of its own, but several battalions of the all-territorial London Regiment were affiliated to it and wore the Royal Fusiliers’ cap badge. Edward Charles Christian: Further details of many of the “Old Boys” from Wolverhampton Grammar School are featured on this website. Bertha Mary Cooksley: Bertha Cooksley has a service file at the National Archives and there is a possible match in the death records, Bertha M. Corbett, Wirral, March qtr1940. There is also an entry in the Register of the Royal Red Cross. Ernest Haden Elliott: There is a memorial at the British Library to Librarians who fell in the Great War, although Elliott does not appear to feature on this. Further information on this is on their Facebook album, as well as on an old blog post. As well as the memorial detailed in the original post, Elliott is also commemorated on the RAMC memorial in St Peter’s Church and St Luke’s Church memorial in Blakenhall. James Maddocks:The fact that he attested in December 1915, but his service did not begin until April 1916 suggests he enlisted under the terms of the Derby Scheme (named after Lord Derby, the director of recruitment). This was the last attempt to keep enlistment voluntary, without the need for conscription. Martin O’Connor: The fact that his death was attributed to his war service is corroborated by the fact he has an entry in the CWGC register (deaths up to 1/8/1921 can be recognised by them) which shows him as an RAF sergeant major. His RAF record can be found in AIR 79/14/1085 – the final part of the reference is his service number. Harold Bantock Sankey: Harold won the Military Cross in September 1916 during the attack on Thiepval (part of the Battle of the Somme). He was carrying out the highly dangerous task of forward observation officer feeding information back to 241 Brigade’s artillery batteries. Harold Joseph Beech served with the 2nd Battalion, The Royal Scots (The Royal Regiment), not the Royal Scots Guards as stated in the post. He died near Kemmel. 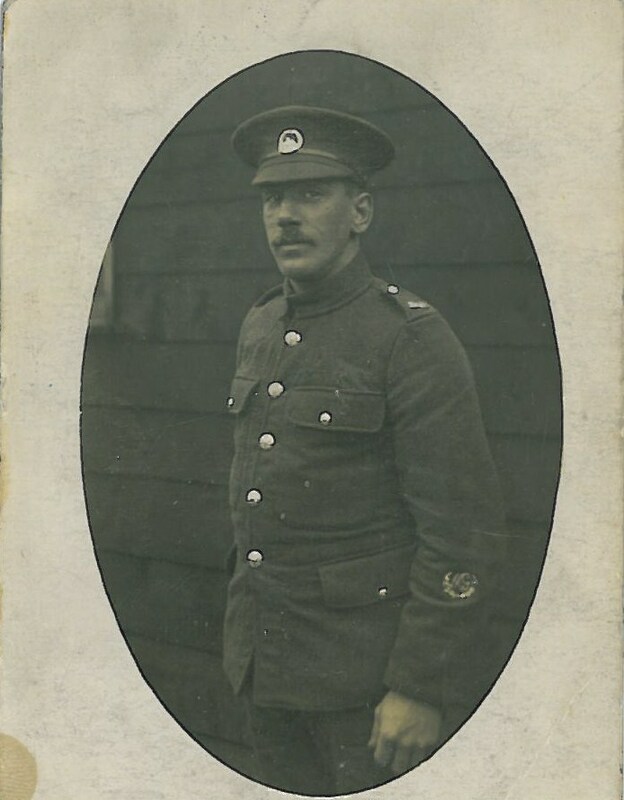 Joseph Downing joined the Staffordshire Regiment on 2 October 1911. He was discharged on 7 April 1917 with sickness with silver war badge number 44239. It also appears that the Joseph Langley Downing featured in the post was not, in fact, the relative of the original enquirer, as the death dates were different. It is likely that Joseph Glaze was wounded in action on the front line near Grandcourt. Two men from the 7th Battalion were wounded on 15 December 1916, with 13 casualties the following day. On 17 December they returned to brigade reserve at Englebelmer. This is taken from the History of the seventh South Staffs Regt edited by Major A H Ashcroft. One of our volunteers recognised the Ash View address of Annie Lloyd. The Lloyd family appeared in the 1911 census living at Ash View, the Scotlands. Annie was 16, living with her father James, a “Vermin Steel Trapmaker”, mother Selina and brother Alfred (14). There are four other households that have Ash View as their address in these returns, so it was possibly a terrace of houses. It seems that the address could be on the Cannock Road, but there are not many houses around so the returns cover quite a wide area. He looked through other nearby returns to see if there was a Horace anywhere close but no luck on that. One of our readers was very interested in the story of Jack Reading Caswell. 30 years ago she had bought a large framed collection from a London antique shop containing J R Caswell’s medals, the Wolverhampton memorial scroll & the letter from the King. She has offered to send us a photograph which we can add to our collections. At the time she wrote to his old battalion for a brief record of his war & visited his grave in France. We welcome all additions and updates to information we have already posted, so please get in touch if you can help with fleshing out some of the details! We are appealing to our various social media followers for help again! One of our Twitter followers has sent us the above photograph, which includes her grandfather. He fought in the 4th battalion of the South Staffordshire Regiment during the First World War. She has got his regiment records, but she would love to know more details of who the other people are on the photograph. She will hopefully be visiting the Archives soon so that we can assist her with further research, but can anybody help in the meantime? Yesterday saw the launch of the new World War One Engagement Centre, funded by the Arts and Humanities Research Council (AHRC) with the Heritage Lottery Fund (HLF). Set up by the Universities of Wolverhampton and Birmingham, with support from Newman College, Birmingham City University, and Worcester University, the Centre will be based at the new Library of Birmingham. Because of the link with Wolverhampton, we are very proud that the launch included schoolchildren reading from material held at Wolverhampton City Archives. These detailed the deaths of two local people during in the First World War, one fighting in the trenches (in the case of Jesse Hill), and one dying at home (Maud Fellows). Both stories have already been featured in more detail on this blog. A photograph of Jesse Hill is also featured in our banner at the top of this blog. Highlights of some of these resources are also featured on the website of the Engagement Centre, entitled Voices of War and Peace. You can follow updates from this Centre on Twitter. Thank you all for your responses to our appeal for more information on T. Roberts, who was awarded the Serbian Gold Medal for distinguished service during the First World War. With your help, we have been able to flesh out a bit more detail about the man behind the certificate, mainly thanks to this article in the Express & Star. Tom H. Roberts was appointed Curator of Wolverhampton Art Gallery in 1948, having been Senior Assistant Curator for the previous 26 years. According to the article, he served for four years during the First World War, before being wounded and torpedoed, and most of his war-time service was spent as a member of the British Mission to the Serbian Army. This explains why he was awarded the Serbian Gold Medal, as well as why the certificate has found its way among the collection of material from Wolverhampton Art Gallery. We are still somewhat in the dark about his background, though, and, given the relative high frequency of his surname, we still need a bit more information before we can try and unearth his military records.